Perth Child Fine Art Photographer – I like how that sounds! Despite the fact that I do love this pram, I am trying to destash the things that I really don’t use very often from my studio. This has been on the list for a while. However, I have deliberately held onto it waiting for Cove to be able to sit on his own. I have wanted to photograph him in it surrounded by his sisters. This weekend just passed the girls were invited to a birthday party. After two weeks of swimming lessons I had a reason to wash their hair – all at the same time. After the party they were ready for a swim but after all my “efforts” I was not letting them get away. So I threw this set together very quickly. I would have loved a variety of dark dresses (to make it a bit more masculine) but these lovely Hubble and Duke dresses was all I had. And I have just two so a composite it had to be. Considering safety, I think this was actually the best approach. 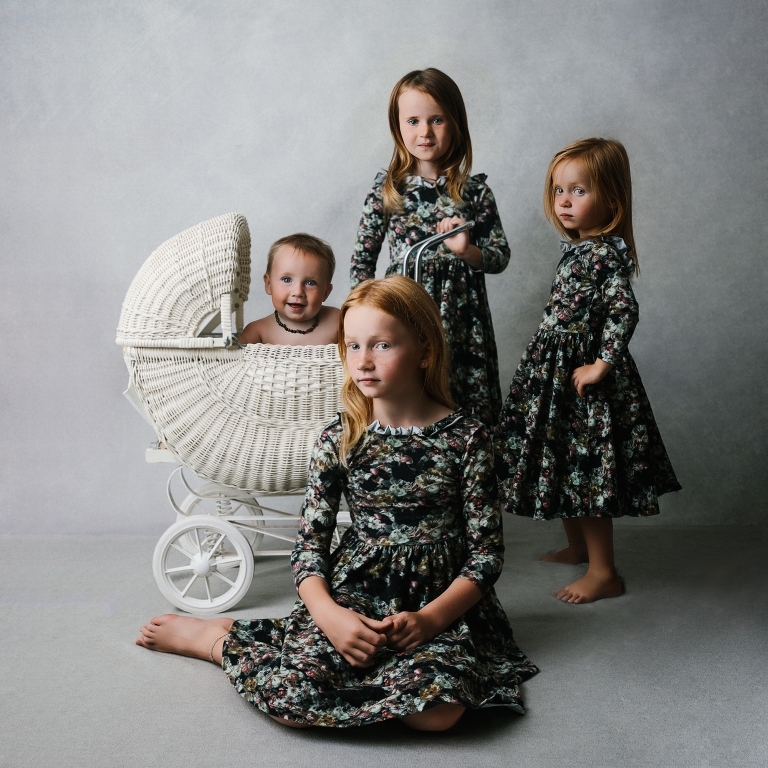 I photographed the two eldest with the pram and then got my little girl with her baby brother. My husband was spotting as Rosie is a little wild now. It was really a quick shoot as they don’t love me with my camera out any more but I am really happy with how it turned out. I feel that fine art portraits will have to become my thing.